This the third recipe for Good Friday. The other recipes are Pomegranate Salad and Jacobin Sops. If one grows spinach in the kitchen garden, or is from an older generation, one might remember the sharp-edged seeds of some varieties of spinach. Spinach had to be washed very thoroughly to remove all those unpleasant seeds. Nowadays all spinach that can be bought is of a seedless variety. 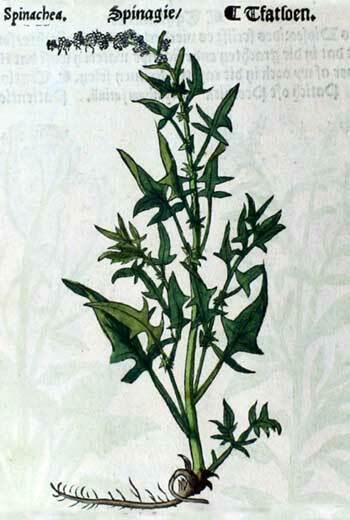 Today spinach is a common vegetable, but once it was a new and exotic addition to the table. It originates from Persia and pread,first to the East toward China, and a little later to the West. 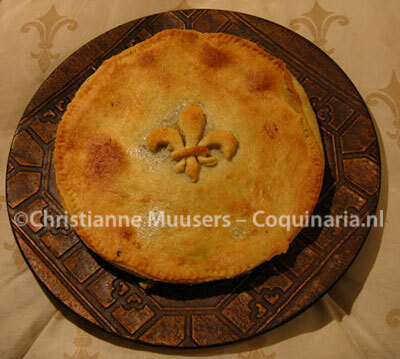 On Coquinaria is a Arab recipe for small spinach pastry from the thirteenth century. The spinach in the picture is from the Cruydeboeck (‘Book on herbs’, 1554, see bibliography) from the Flemish physician and botanist Rembert Dodoens. According to him spinach is being sown in kitchen gardens in March or April, or in the Autumn to have spinach available all winter. But only summer spinach yields seeds. This recipe, like the one for jacobin Sops, is from the second edition of Le nouveau cuisinier […] from Pierre de Lune (1660, see bibliography). Blanch the spinach in boiling water. Shake it and chop finely. Season with butter, salt, cinnamon, sugar, grated or peeled lemon zest. Prepare a dough with flour, butter, white wine and salt, and stuff it. Glaze in the same way as the other [tourte in the previous recipe]. Sprinkle with sugar and orange blossom when it is served. This pie is made with a simple dough, but it is special because the dough is prepared with white wine instead of water. The amounts in the recipe can easily be changed, as long as the proportions remain the same (in weight flour:butter:wine = 2:1:1 – in volume 9:2:2). Other recipes for dough on this site. Side dish for 8 to 12 persons or vegetarian main dish for 4 to 6 persons; preparation in advance 25 minutes; preparation 45 minutes. Dough – Mix flour with salt, add butter and wine, and knead until a supple dough is formed. Keep kneading at least ten minutes, then wrap in plastic foil and let rest for an hour. Preferably not in the refrigerator, the butter will harden and make the dough too stiff to roll out. Stuffing – Blanch the spinach, drain well and squeeze to get it as dry as possible. Instead of blanching, you can also stir-fry the spinach without adding any liquid, with a little butter. Chop the spinach finely. If you’re lazy, just buy a package of frozen spinach, let it thaw and squeeze the spinach dry. Pour boiling water over the lemon (even when using organic fruit, because these also have a wax layer to prevent them from drying out) and use a zester to get the zest of a quarter lemon, or use a grater or small flexible knife. Take care to use only the aromatic yellow, discard the white. Grease a pie mould with butter. Roll out the first half of the dough. Before rolling, flatten the dough ball with your hands, sprinkle the worktop with flour, sprinkle also some flour on the dough. Roll out to a fairly thin sheet, drape this in the mould, let the dough hang over the sides. Melt butter for the spinach, add to the greens together with salt, cinnamon, lemon zest and sugar, mix well. Scoop the stuffing into the piemould. Roll out the rest of the dough and drape this over the stuffed pie mould. Press the two sheets of dough together and remove overhanging dough. Decorate with leftover dough. Be inspired by seventeenth-century art, or anything that strikes your fancy. Melt butter for glazing, add milk, and glaze the piecrust with it. Place the pie about one-third from the bottom of the oven and bake thirty minutes until the top is nicely coloured. Check however from twenty minutes onward, because some ovens bake faster than others. Just sprinkle some sugar and orange blossom water over the pie just before serving. Of course you show the pie to your guests before cutting it, so they can admire your artistic handywork! Then divide into the desired number of slices. Eat the pie hot or warm, because the butter will solidify again when the pie cools down. This pie can also be served as a vegetarian main dish, if you serve something like boiled or poeached eggs along with it. Do not serve with a salad with lettuce or other leafy greens (because spinach itself is a leafy green). In French you have tarte and tourte. The first is an open pie, the other closed. Rembert Dodoens, Cruydeboeck […] (Plantijn, 1554) Online version. Edition 1664 is also online available. Pierre de Lune, Le cuisinier où il est traitté de la veritable methode pour apprester toutes sortes de viandes, gibier, volatiles, poissons, tant de mer que d’aeu douce: suivant les quatre saisons de l’année. […], from 1656. Edition: L’art de la cuisine française au XVIIe siècle (Payot), Paris, 1995 pp. 239/437. This 17th-century French recipe is meant for Good Friday. The dough that is used is also special, it contains white wine instead of water.